- The third quarter of 2016 confirms the business momentum observed since Q3 2015. Q3 2016 revenue totalled €272.9 million, an increase of +7.3%, with growth of +5.8% at constant scope and exchange rates (organic). - The transformation plan implemented in France in early 2015 continues to pay off in terms of growth and margins. - The Group accelerated its customer and geographical diversification. Its operations outside France grew by +10.8% (+8.0% organic) over the quarter. The Group’s now generates 56% of its revenue outside France. - France posted Q3 2016 revenue of €119.0 million. Organic growth was +3.1% year-on-year, despite a more demanding comparison base. In a market driven by growth in the automotive sector and a resumption of growth in railways, the Group benefited from its position in the mobility sector and its ability to gain market share. The Group launched a national hiring campaign to build on this momentum and make up for the slight increase in turnover resulting from the vigour of the market. Very positive early results began flowing through in October, with 100 net new engineers hired in that month. - The pace of growth remains high in Germany. 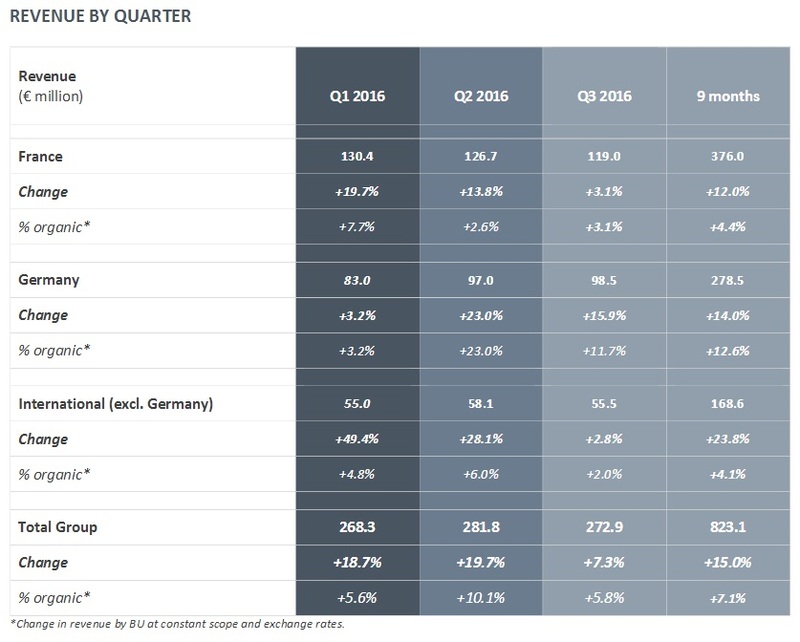 The German business unit reported Q3 2016 revenue of €98.5 million, representing organic growth of +11.7% (+12.6% over the first nine months). Strong growth was recorded with the vast majority of legacy and newer customers alike. AKKA Technologies accordingly recorded double-digit organic revenue growth over the quarter with BMW, Bosch and the Volkswagen Group. The new regional organisation ushered in during the second quarter on the three main industrial basins (Northern, Southwest and Southeast Germany) will enhance the agility of the business unit and its proximity to customers. This will in turn accelerate its diversification and gradual improvement in margins. - International operations (excluding Germany) posted revenue of €55.5 million in Q3 2016, an increase of +2.0% compared with Q3 2015 on an organic basis. Most countries and regions grew strongly over the period, including the United Kingdom, Spain, the Czech Republic and Romania. The Oil & Gas business continues to suffer from the sector’s weakness, although the signing of a contract with Saipem confirms its medium-term potential. The continued deployment of the Group’s business model in recently acquired companies and faster hiring confirm our promising prospects internationally. - 3,000 employees threshold internationally. The Group hired 661 employees in the third quarter. As of 30 September 2016, the Group had 13,055 employees, of which 6,248 in France, 3,665 in Germany and 3,142 internationally. Continuation of the Group’s transformation: AKKA Technologies benefits from its project expertise in turnkey projects, its innovation capacity and its international positioning to accelerate its customer and geographic diversification. After the signing of initial contracts with Northrop Grumman, PSA and Stelia in the first half, the Group won several major contracts and entered numerous supplier panels during the third quarter. Among the biggest, AKKA Technologies won a three-year turnkey project for the deployment of infrastructure for a telecom operator and a five-year contract for the upgrade of technology for the DGA, focusing particularly on convergence and security. The Group also entered the SNCF Réseau supplier panel. In the energy sector, Epsco won a large contract with Saipem, confirming the strategic value of this acquisition completed last year. - 2016: The good performances notched up since the start of the year, with growth of 15.0% over the first nine months (of which organic growth of 7.1%), enable the group to confirm its 2016 guidance, namely organic revenue growth in each of its three business units in 2016 and a further improvement in its margins. - 2018: Sales momentum, faster hiring and recent acquisitions will fuel growth in the coming half years. The transformation plan implemented in France in early 2015 resulted in a strong improvement in margins in the first half of 2016. Germany also aims to improve margins progressively, through a combination of its return to growth, the new organisation and the Margin Improvement Plan. - The Group aims at the same time to pursue its external growth strategy through targeted acquisitions generating organic growth. The AKKA Technologies Group has more than 12,000 employees and operates in 20 countries, namely Belgium, Canada, China, Czech Republic, France, Germany, Hungary, India, Italy, Morocco, Netherlands, Romania, Russia, Spain, Switzerland, Tunisia, Turkey, UAE, UK and US. It is focused on building a group of €1.2 billion in revenue, of which more than 50% outside France. AKKA Technologies is listed on Euronext Paris – Segment B – ISIN code FR0004180537.